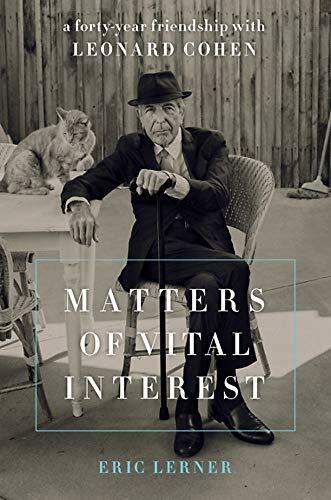 If that description sounds like a delightful read to you, then welcome to this memoir of sorts, one in which screenwriter and author Eric Lerner details his long friendship with that great poet/songwriter/singer from Canada, Mr. Leonard Cohen. In fact, this weird hybrid of memoir/biography is wonderful, and one suspects it’s exactly the kind of retelling of the Leonard Cohen myth that the poet would have approved of without hesitation. “I could see his hands make sharp, sweeping movements as he snapped the hem of his robe over his knees and tucked it under his feet, turning himself into an impressive black pyramid. I lifted my gaze surreptitiously to glimpse his face. Later, the two have a moment over the sneaking of cigarettes, and recognize each other’s kindred spirit. It’s only a very short leap before these two are sharing a house in Los Angeles and drinking themselves silly at old Mayflower Hotel in New York City. You’ve got to love this type of bio as it describes the most mundane but very human day to day life of a heralded songwriter like Cohen. Like the times Cohen entertained his sister in his Mayflower hotel room. We are told Cohen adored his sister Esther but, you know, tolerated her, too. Just before she arrives, Lerner and Cohen make a beeline for a nearby supermarket. They are, at their essence, two good Jewish boys. Over the years, the two talk about everything imaginable—women, family, Cohen’s struggle with his record label (It’s hard to remember now but, before his well-deserved comeback toward the end of his life, Leonard Cohen was ice cold in this country. ), careers, and toward the end, the meaning of life and death. There are many wonderful anecdotes here such as the time Cohen presents his latest recording to Sony honcho Walter Yetnikoff. “Leonard, we know you’re great but we don’t know if you’re any good,” Yetnikoff tells him. And with those words, Yetnikoff sends Cohen’s LP off to international sales, refusing to release it in America. But, Lerner tells us, Cohen thought Yetnikoff was right—there was no surefire “hit” on that album. Cohen tried doubly hard on the next record and wrote a handful of great songs but again, they went nowhere. At that point, Cohen gave up, sold his song catalogue, and fled to the monastery. The only reason he resurfaced in time for his last and perhaps best act was because a trusted advisor stole all his money. Cohen had to go back on the road, but his time had come and the tour were a vindication of a life’s work. A final email comes in which “Old Leonard” tells “Old Eric” (the way the friends referred to each all their lives) that he’s fallen on the way back from the bathroom and hit his head—hard. By morning, Leonard Cohen was dead.